As the iPad is still in its infancy, so, too, are good iPad-native Twitter clients. One rapidly maturing client is Twittelator for iPad, and it just got a great update with some useful new features and major performance improvements. Twittelator for iPad 1.1 from Stone Design now has a “Slide to Send” button. Instead of sending a half-finished tweet by accidentally tapping what used to be a typical Send button, users must now swipe across an actual slider in order to publish. Frankly, every app that can send to a public venue should take a cue from this feature; heck, it wouldn't hurt to have this in Mail either. Kudos to Stone Design for a brilliant bit of UI design. Also new in this update is a “Channels” area that collects must-follow Twitter accounts into various categories and subcategories like “Business,” “Health,” “Sports,” “Tech,” “Coffee & Tea,” “Cloud Computing,” and, of course, “Apple.” This Channels feature is a killer way to help new Twitter users find good accounts to follow, and it’s built right into the app. Finally, Twittelator for iPad 1.1 also implements some significant performance and interface improvements. For example, tasks like downloading new tweets or switching between sections is dramatically faster, and the bottom toolbar in portrait mode now features all major sections, including your main friends timeline (it used to be awkwardly placed in a button popover in the top left). You can now copy, quote, retweet, and mark tweets as favorite with a simple tap-and-hold, and multi-account support has been much improved. 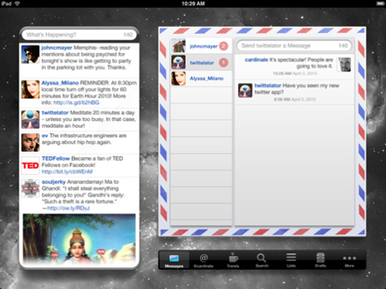 Twittelator for iPad 1.1 is $5 and requires an iPad running iPhone OS 3.2 or later.